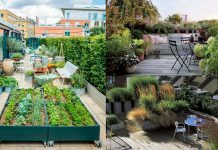 These 23 (Rooftop) Terrace Garden Tips will help you in transforming your urban space into a green oasis. You love to garden but you don’t have a piece of land. 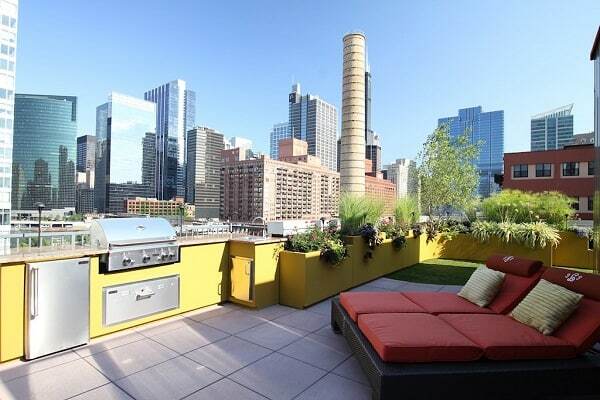 No problem, you can have a garden on the rooftop, however small. It is not necessary to abandon the idea of being able to create a natural paradise. 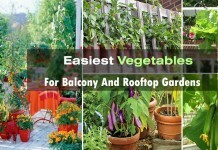 There are many tricks and clever ideas to do this and here are a few rooftop gardening tips that’ll help you. 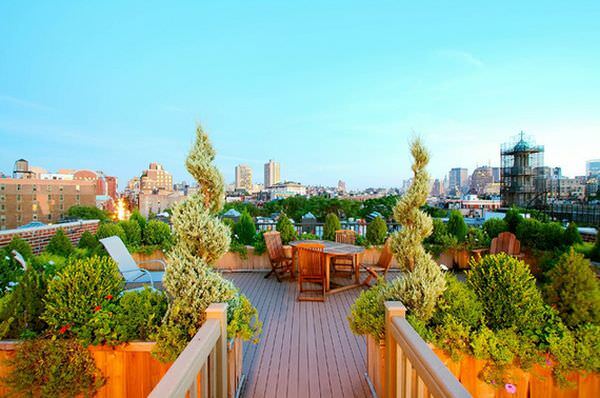 Create a theme for your rooftop garden and stick to it. Choose plants, furniture, and other accessories according to it. 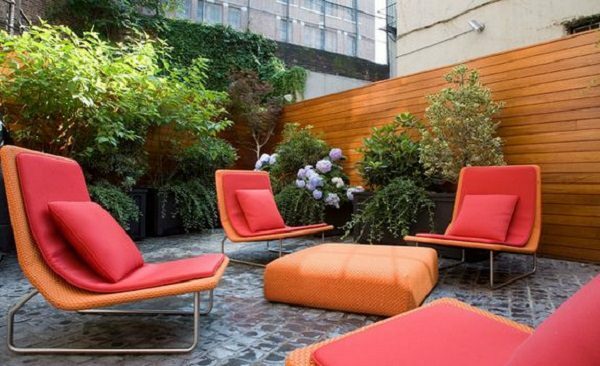 Creating green walls and hedges can completely transform a rooftop terrace into an unbelievable outdoor area that can even look like a regular garden. For this, create tall and dense vegetation around all the corners that will offer you total privacy and a perfect setting for outdoor dining and relaxing moments surrounded by nature. 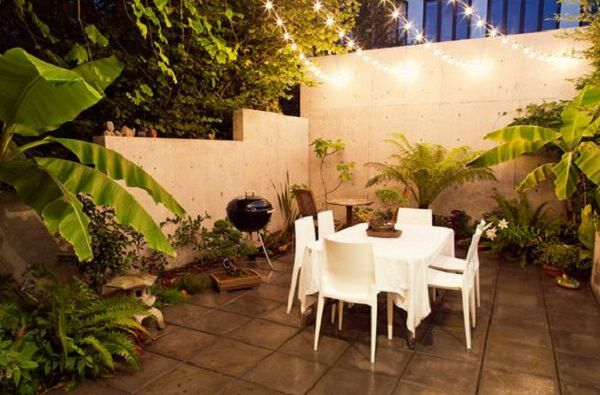 In our terrace garden tips, lighting is very important. Good lighting can enhance the beauty of the vegetation. 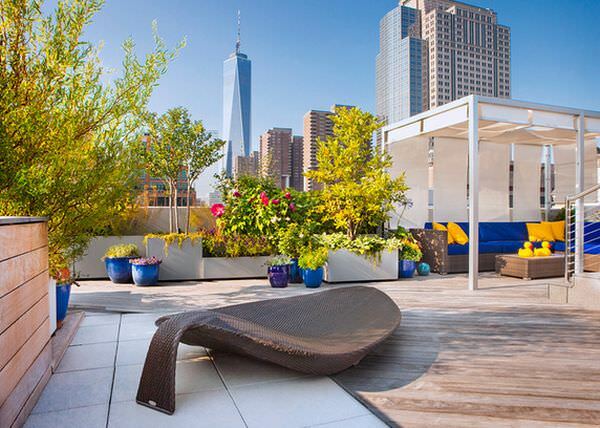 This way you can enjoy the evening on the rooftop garden. 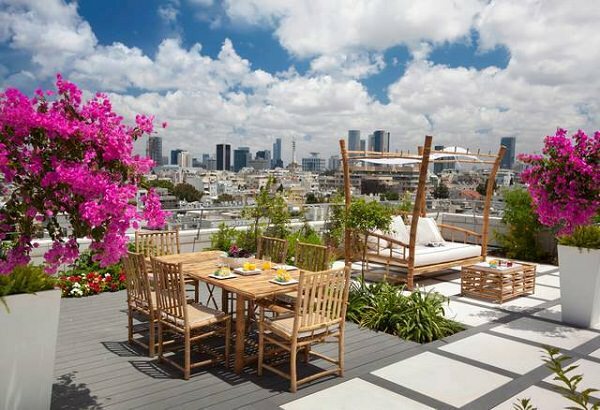 A roof-top has a parapet or breastwork, make that low wall little high so that you can use that as a support for growing climbing plants and creepers and if you need shadow in sitting area, umbrellas in light colors are perfect. 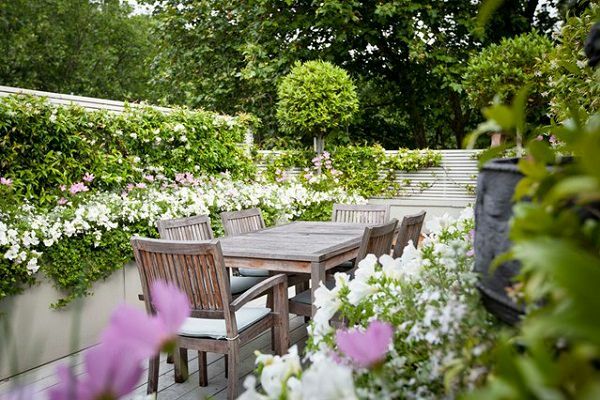 Flowering annuals can completely transform the look of any garden when they bloom all together. You can plant different species of flowers for every season. Opt for a combination of two or three colors to create a harmony is a good idea. While choosing furniture, take care that they are light, durable and must not take too much space. 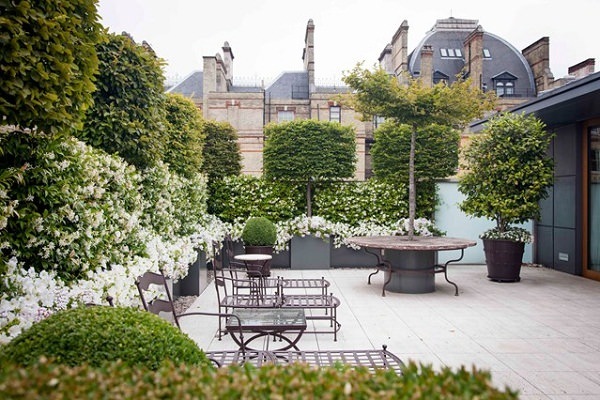 Although small, this rooftop garden is totally unique and appealing with the addition of two interesting things: The ivy topiary and a large mirror, which opens the view and creates the illusion of enlarged space. 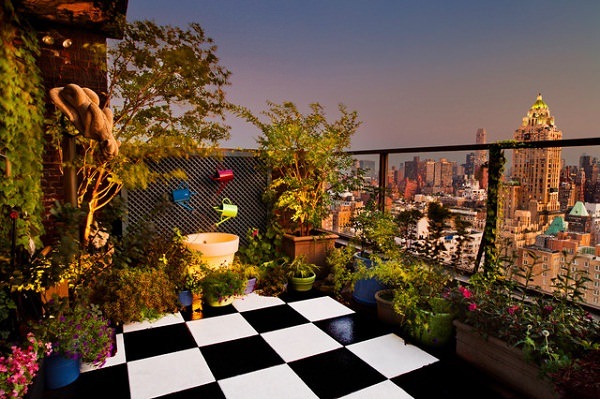 Adding a mirror is one of the useful rooftop gardening tips. 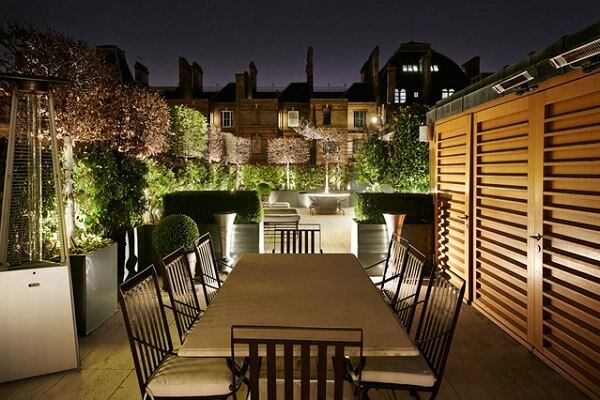 If tall buildings surround your terrace or you have got an interesting view from there then it makes no sense to try to get privacy. 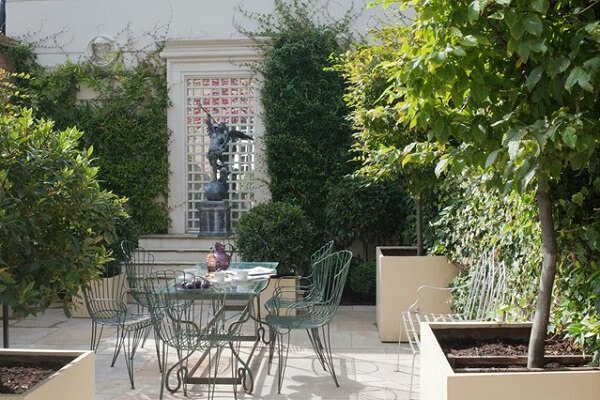 Instead, concentrate on the open space and include large planters so that you can grow large trees in them. You can also make a great looking, elegant terrace or roof top garden by just growing conifers and beautiful foliage plants. Choose simple plants that love the direct sunlight and opt for designer containers. Do not make compromises– the planters are as important as what they contain. Being able to enjoy a breath of fresh air right above your urban dwelling is wonderful. 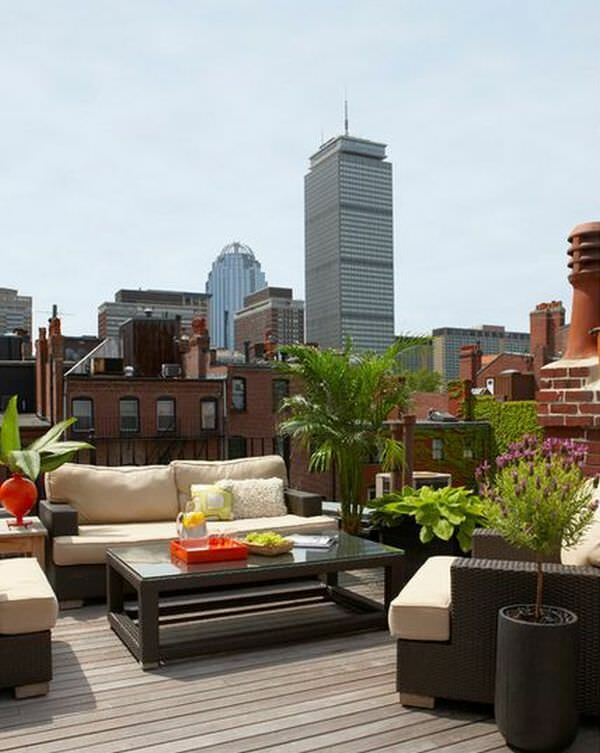 With a little creativity, you can turn the rooftop garden into an outdoor living room, adding a bar or a kitchen countertop is also a good idea. Use as many natural materials as possible. For flooring use natural stones. 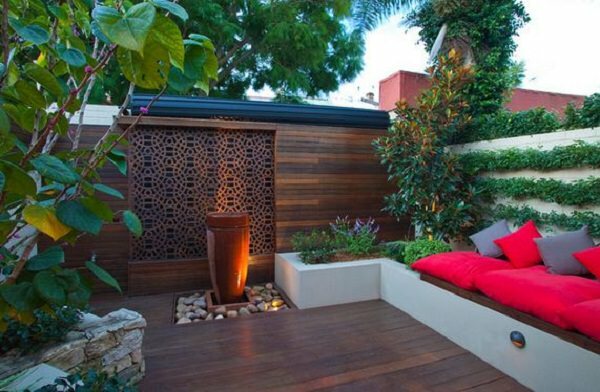 Arrange wooden planters or construct beds using sandstone bricks. For seating you can buy tree stumps, they are inexpensive and do not take much of your space. This is a great way to create a more authentic and natural environment. Bright colorful shrubs in combination with a neutral decor will create a dazzling effect and on the contrary if you have a colorful setup and gaudy furniture, grow neutral plants. Choose a flooring style that is deep and bold and eye-catching. Keep the color combinations in mind to give a unique touch to the rooftop garden. Whitish beige is a main color here combined with blue and yellow. Don’t use so many colors. Decide three or four main colors and use their shades, if you want more. 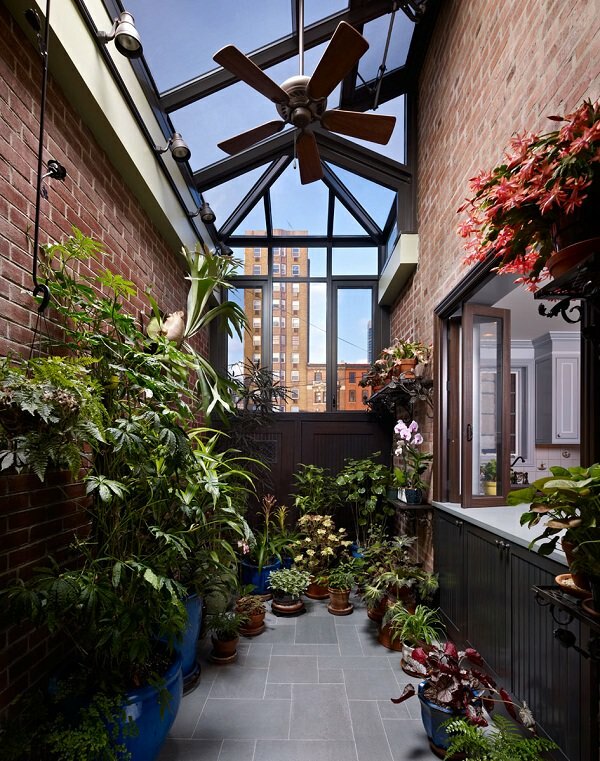 A terrace garden does not necessarily need to include a large number of plants, trees, and flowers. A manicured, lush green lawn and a couple of planters or well-maintained borders against the wall are sufficient to create an impressive style. 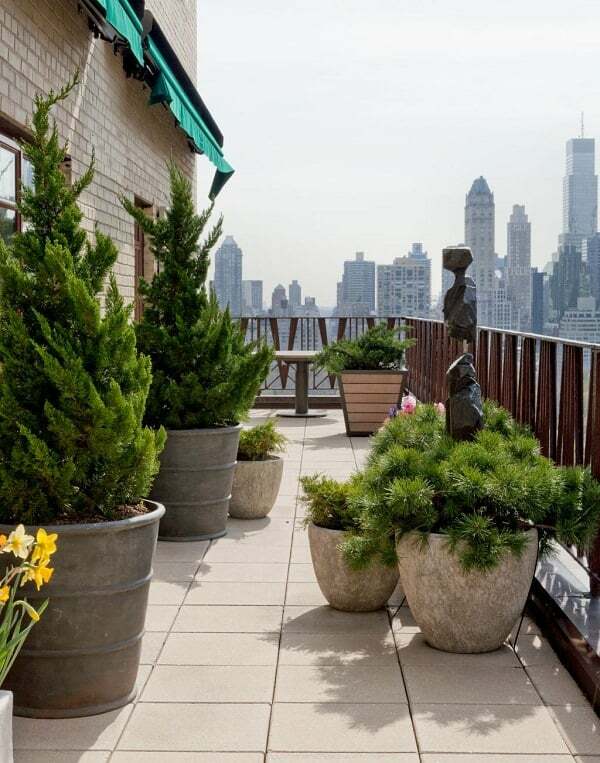 If you have a small rooftop, it is better to have a couple of big planters rather than so many small containers, so as not to overwhelm the space or create chaos and disorder. 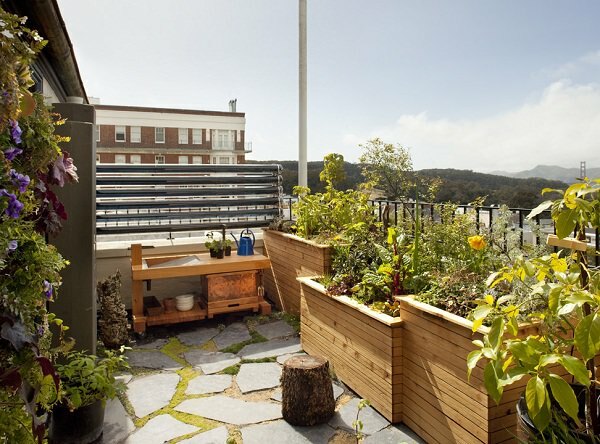 Create raised beds all around the roof, raised beds can be metallic or made of wood. You can also construct permanent concrete raised beds. But before doing this, ensure your rooftop can bear that much weight. 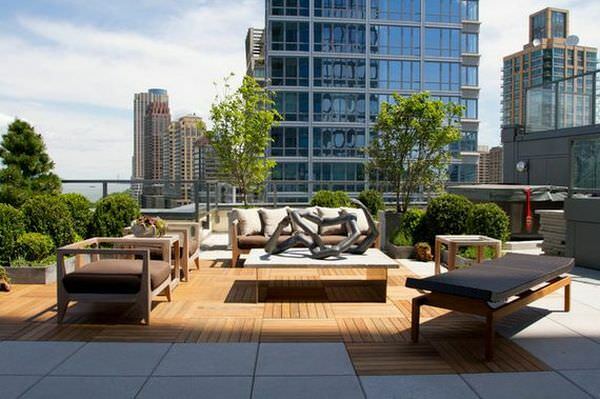 Read our article on how to construct a rooftop garden for more information. 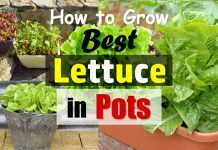 Don’t want to grow so many plants? Place colorful and modern furnishings to transform a small space into an attractive sitting area. 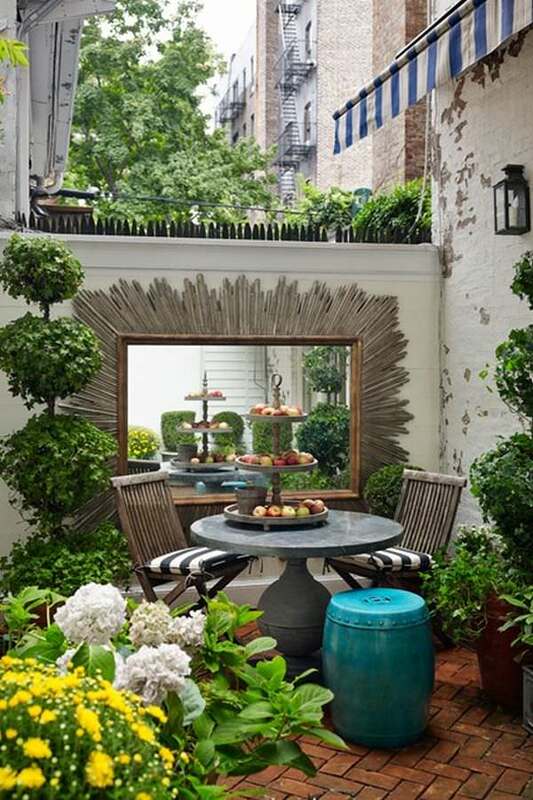 Don’t forget to add a focal point on your urban terrace garden. Place something to allure the eyes. Adding the water element, through the insertion of a small fountain is a great idea, you can also create a small container pond. 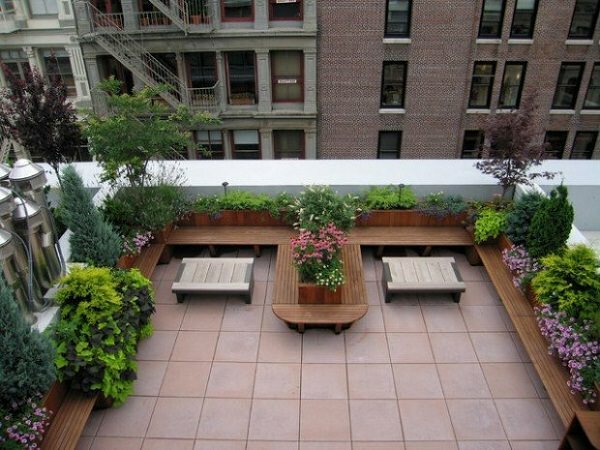 Maximize the seating space of your roof or terrace by fixing wooden benches along the raised beds. String lighting works wonderfully in open spaces. It enhances the small spaces. 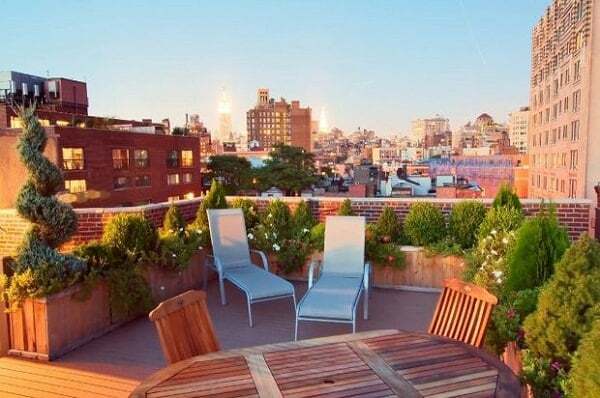 Most of the rooftops receive all day long sun and in such a case adding solar lights is a smart idea. Each space has its own characteristics: Positive or negative. 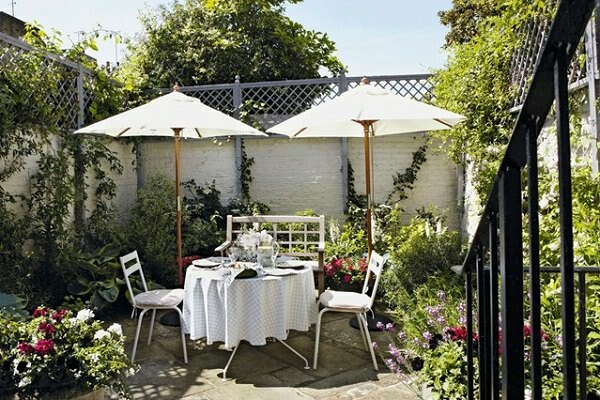 An outdoor area can be a challenge if it is long and narrow. If your space is similar, try using things of wavy, curvy and circular shapes.